autopartszone2008 has no other items for sale. You should pay it in 5 days. Great price and fast shipping- is working perfectly- very happy with my new toy! Good seller, fast delivery!! Haven't started/used yet. Item was new condition. Arrived on time. Communication was very good. 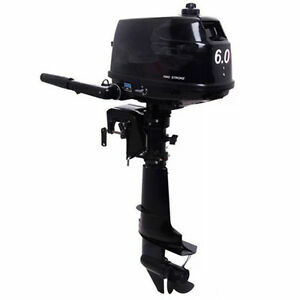 The Hangkai 2-stroke 3.5hp Engine is an overall good product. Mixing oil with Gasoline to complete the oil ratio. This engine is equipped with acceptable power and mobility. I have driven 2-3 mile throughout a day on the open water and through tough current! 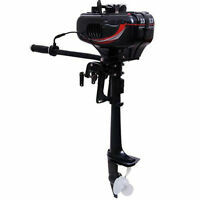 Hangkai 2-stroke 3.5hp outboard Engine If you fit this Motor to the correct water craft it is very Enjoyable! "I used this Engine on a Sun Dolphin square stern canoe." YouTube video: Allen E. Boating Issues: 1. 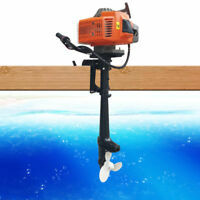 Is depth into water; your boat/craft would have to shallow enough propel through the water. Around 17"inches 2. This Engine does not start easily and canoes are unbalance and when turned you'll loose everything you have. To start quickly prime the fuel bubble - set the carburetor to off pull start 1-2 times. Then move the Carburetor to on/start and pull to start quickly. Remember: Also purchase a trolling motor and a automotive jump start pack from Wal-mart. Because boating is the most careless and dangerous thing you can do! You need both to operate correctly watch the video. Bought this for use as a trolling motor for my 21' bay boat. Based on other reviews, I tightened all the bolts before using (several were loose). I also disassembled the lower unit to make sure the gear oil was full. Hard to start when cold even with choke engaged, takes 8-12 pulls and you must keep ahold of the handle to add throttle so you can't use that hand to brace the engine and it tends to pull up (the little bracket to hold the engine down only locks when the motor is reversed). (Note - as per other reviews, the choke is labeled backwards). Also, there is a reason why they send you a spare pull start assembly - mine failed on the first trip on the water - the rope wedged down into the starter assembly and melted through after the engine heated up. It was easy enough to repair but annoying so will have to see if it happens again. 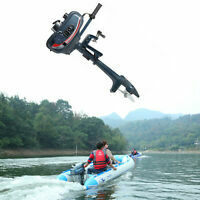 As per other reviews, it is quite noisy - not much better than the 200 HP outboard on my boat. All that being said, it does work - it pushes my boat around and only cost 200 bucks. I was skeptical at first. I changed the spark plug to Champion CJ8. I added 90w gear oil. Double-checked all the bolts and also checked gasket on water outlet. I used NON-ETHANOL gas from sphinx. It was .50¢ more a gallon but worth it since I know the fuel lines aren't the best. I mixed oil to gas 40:1. Primed about ten times and it cranked on the fourth pull. Cranked it up the next three days after, then on the water on the fourth day. It ran good, it does have the occasional sputtered where it would lose power. But release the throttle and then back on. It turned off a couple times due to not enough throttle to keep the water cooling working, but it cranked right back up. The motor kept jumping out the water and I have to figure out how to resolve that (guessing the waves) from the other boats. It is very loud, twice the noise of a weed eater. But overall, great motor for the budget friendly. Great little motor for the price! Lightweight, but has a few "issues"
This works and is lightweight, so it's easy to carry and load and doesn't put too much stress on the transom. However, it's a little fussy. Takes a bit of effort to start, 6-8 pulls average. It does run ok, but it has a tendency to cough for no apparent reason and that makes the propeller jump out of the water. The latch to hold it up is spring loaded, so if you have it up and even bounce a little it drops down, so you can't leave it up on the boat while moving it around. Ran better after some use but now has developed a strange squeak. It will probably need to be taken apart over the winter and tinkered with. If you are handy and mechanical you can probably keep it running fairly dependably, if you aren't this probably isn't your machine. The price was so good, and the reviews were informative, I made an informed decision to buy anyway, but I knew it wasn't going to be a gas and go item.